Broken Monsters is one of the best paranormal and genuinely horrifying thrillers I’ve read in years. Lauren Beukes’s fourth novel, about a possessed serial killer with a penchant for human taxidermy and an unquenchable thirst for attention, seamlessly fuses the unbridled ingenuity of Stephen King with the master craftsmanship of Michael Connelly’s police procedurals. With its integration of Reddit feeds, social media and text messaging, Broken Monsters is an unabashedly contemporary thriller, fresh in its approach and narrated with the stylish prose we’ve come to expect from Beukes. The novel opens at a crime scene. Immediately we’re introduced to Detective Gabriella Versado, who is no stranger to working homicides, but has never seen anything like this: a young boy has had his torso attached to the hind legs of a deer. From there, the novel opens up, expanding to a cast of five characters, including Versado’s daughter Layla, a desperate freelance journalist, a homeless man named TK, and the monster who is obsessed with remaking the world. Their storylines play out separately, then coalesce powerfully in a pulse-pounding climax that had me sitting upright, desperately turning the pages. Layla was my favourite; a sassy young teen who is determined to do the right thing, but lacks the life experience to properly do so. The teen dialogue rings true – laced with expletives, wit and sarcasm – and the emotional moments between mother and daughter are just as strong. Their relationship feels real, despite the surreal circumstances they’re faced with. 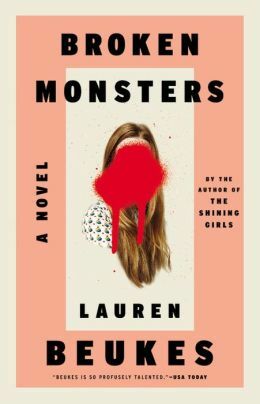 A procedural glazed in the supernatural, Broken Monsters supplants The Shining Girls as Lauren Beukes’s crown jewel. It’s dark and terrifying, but keeps the gore to a minimum. It’s a fine balance, and Beukes nails the descriptions of the horrible sights her characters observe by providing just enough detail for the reader’s mind to extrapolate. They say perfection is unattainable, and maybe that’s true –but Broken Monsters is close to it. My expectations were astronomically high going in, and Beukes swatted them away and squashed them with ease, leaving me to wonder: what’s next?